The Graphics Team works on everything visual inside and outside the game. If you are reading this thread, you have likely decided to dedicate your talents as an artist to the graphics team for the ambitious project that is Thrive! If so, then welcome aboard! This thread is designed to best ease you and other new artists into the process of developing the game, and providing you with all the relevant information you need. Graphics covers a wide range of visual entities. Some of these are appropriate for pure artists (e.g. concept art) but others may require varying levels of programming knowledge, or at least a close relation with programmers to get art assets working in the game. The in-game graphics system is Ogre 3D, the basis of our custom engine. It's open-source software and is compatible with almost any computer operating system. The Microbe Stage features 3D graphical entities on a 2D plane, so all in-game elements should be 3D models (tutorials on creating these can be found below). Often these will be animated and will respond to player or environment events, so animations should smoothly transition from one to another with the underlying code. Some 3D models are procedural, such as the membrane and floating rocks (not yet implemented). These are more complicated to create since they aren't based on static models. As shown here, there's a programmed algorithm controlling its definition and movement. In the future we hope to adapt the membrane to distort on contact with other cells and water currents, but since it's theoretically and computationally difficult even in comparison to the current membrane, we estimate it may take a while to be added. 2D artists could work on the GUI (Graphical User Interface). The version currently in-game is temporary and will need to be replaced. This will require an understanding of Lua scripting. See the tutorials for more information. Concept art is another task for 2D artists. With the exception of the very highest quality images (see our existing concept and promotional art) we unfortunately don't need concept art depicting other stages. Functional concept art should be relevant to the stage at hand and supplement the work of other team members, such as testing GUI designs, organelle designs or general gameplay aesthetic. The key here is breadth rather than depth. Concept art of this kind doesn't have to be beautiful but it does have to run through several alternatives so the team is better informed about visual choices. Compare this image with this. The second is obviously higher quality, but isn't useful for development at the moment, whereas the first (which could perhaps be a little more refined) covers plenty of alternatives quickly and gives an at-a-glance understanding of how the game could look. We'd generally class art of the second type as fan art. It's not inherently better or worse, but it's not what's needed. The exception is when creating promotional material such as trailers, though generally gameplay footage is preferable and more honest anyway. Specifically when you are working on art assets, there are some additional workflow steps you should know. You start by making a model and texturing it in any program of your choice. After you're done with that, you will need to bake your material to a single image texture that will be used in game. The model needs to be exported with a .mesh.xml file extension (then we use an xml converter to change it to a binary file .mesh). Not sure about maya, but for blender there is this plugin: http://www.ogre3d.org/tikiwiki/tiki-index.php?page=Blender+2.5+Exporter. The graphics team always has the potential for more work to do, but here are some of the primary goals for the upcoming releases. The following are some examples of work the graphics team would do. A guide to experimenting with placing art assets into the game, linked with the SVN repository below. Stores all the game's assets. Here is a guide to installing Tortoise SVN (steps six and seven). Once you've created an SVN folder on your machine, you can right click to update (giving you changes made by everyone else since you last updated) and commit (adding your changes to the master SVN for others to receive). 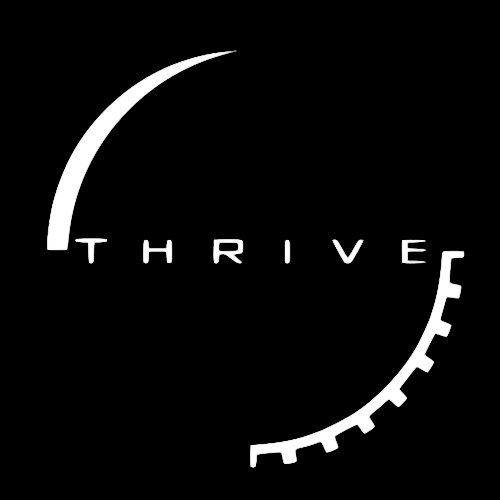 To download the official Thrive font and use it in any sort of game-related art, visit the link above. For interface programmers, this tutorial will outline the basics of Lua scripting within the CEGUI framework. A guide to using Blender and exporting for use in Ogre (our graphics system). How do I join the Graphics Team?